Ever since Bill Budge came out with his Pinball Construction Set way back in the early 80s (the Atari 800 version was distributed by Electronic Arts), these do-it- yourself pinball games have been quite the rage. Just about every computer system in the market has some type of pinball construction program available, and lucky owners of the Atari ST actually have two to choose from. Although, in my mind, there's really no choice. Pinball Wizard from Accolade is the clear winner. For those of you who have never seen one of these remarkable programs, or never had the chance to use one, a pinball construction program gives you a set of pinball parts—bumpers, flippers, spinners, etc.—that you may arrange any way you wish, allowing you to create your own version of the ultimate pinball game. Of course, if you're the lazy type, there are several pre-made games you can load from the disk to play immediately. As far as parts go, Pinball Wizard has them all, and each one can be set to any score value you want. You can even link several targets together, giving the player bonuses when he hits them all, including not only extra score, but extra balls and even free games. Parts are placed on the play area by picking them up with the mouse pointer and moving them to the chosen location. It's so easy, you could put together a rough game in only a few minutes. To create your own solid objects, or to beautify the board, Pinball Wizard's toolbox has a "Decoration and Obstacle" mode, a sort of stripped-down DEGAS where you can paint directly on the pinball layout in two modes. The first mode, used for decorating the play area, is "invisible" to the ball, which rolls over whatever was painted in this mode as if it weren't there. In the second mode, you can actually add, via "paintbrush," non-scoring parts the ball cannot pass through. This lets you create all manner of barriers, including shoots, slides and any other type of construction you may need. Once you have all your painting done, have placed all the parts and set their score values, it's time to set the game's "physics," including slope (the angle of the table), the sensitivity to tilting, the ball's speed, the elasticity (the amount of bounce) of the bumpers, and the number of balls allowed to the player per game. You can also set a feature called "stroboscope," where the ball flips between visible and invisible states at a predetermined rate. 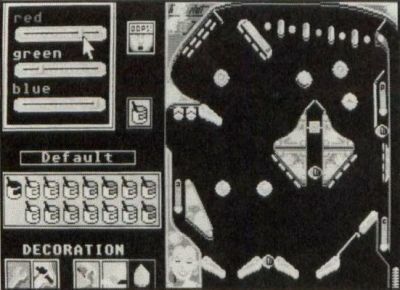 That's one sure way to make even the simplest pinball layout an excruciating challenge. The game can be played from either the keyboard or using the mouse. If you choose the keyboard mode, you may, if you wish, redefine which keys control the game. Unfortunately, Pinball Wizard has one minor problem (or major problem depending on how clever you are). The manual (all six pages of it) is painfully brief, leaving a lot of the program's workings up to your own discovery. It describes the program in only a general manner, not even bothering to give you a rundown on what all the parts are and what they do. You're going to need to do a little experimentation, and spend some time playing the sample games, to get a clear idea of what does what. Still, it's a nice piece of software that uses exceptional graphics and sound, and that can provide the player with many hours of pinball fun. Recommendation: Buy it if you're used to dealing with incomplete manuals. Now, if it's okay with you, I'm going to take a long break from game playing. My head is spinning, my hands are blistered, and all my joysticks are broken. You have my recommendations; all you need now is a software dealer and your wallet. As for me, I'm going to give those joysticks a decent burial—then take a nap.